Because self-publishing has grown in ease and popularity, more and more writers are producing their own work for public consumption. Hence, I see the need for more instruction in the use of grammar and capitalization and punctuation, particularly marks like the em dash that may not be well known. This post, with some minor editorial changes, first appeared here in April 2010. It’s about time I dusted it off, so we can take another look at em dashes. But be prepared: it comes with a writing exercise at the end, for those who wish to undertake the practice. I’ve been accused (gently) of overusing em dashes, commonly referred to without the qualifying “em.” These punctuation marks [—] differ in length and use from their lesser known, and shorter, cousins, the en dashes [–]. The thing about em dashes—they are incredibly versatile. They can do some of the jobs that commas do or ones parentheses do or even those that colons do. Maybe em dashes are the lazy writer’s answer to punctuation dilemmas: when in doubt, use em dashes. 😉 Well, it works for me! Like anything else in writing (and in much of life), however, too much of a good thing becomes not such a good thing. In other words, em dashes in every other sentence may become distracting. With that caution in mind, let’s look at specific uses of em dashes. First, they separate information that amplifies or explains from the rest of the sentence. Commas, parentheses, or a colon can do this too. Here are a few examples. The king—unable to sleep—called for the steward to read the scrolls detailing the affairs of state. The king (unable to sleep) called for the steward to read the scrolls detailing the affairs of state. The king, unable to sleep, called for the steward to read the scrolls detailing the affairs of state. The basketball coach mapped out his plan of attack—a plan he hoped would surprise the opponent. The basketball coach mapped out his plan of attack: a plan he hoped would surprise the opponent. 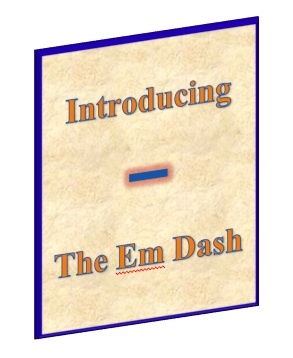 A second use of the em dash is to separate a subject (or a series of subjects) from a pronoun that introduces the main clause. Lewis and Tolkien—they are the founding fathers of Christian fantasy. As noted in an earlier post, “The Ellipsis or the Em Dash,” there’s a third common use—to indicate a sudden break in thought or speech. Before she could finish her threat, Jeff slammed the door. One more important point: no sentence should contain more than two em dashes. If further amplification is required, then commas or parentheses should be used. But what about the en dash, that shorter little mark so similar to a hyphen? The Chicago Manual of Style says its principle use is to connect numbers (and occasionally words). For example, if you give a span of time, say, between 1999—2004, the proper mark between the numbers is the en dash. So here’s an exercise if you choose to do it: First, look back at this post and see how many em dashes I used, apart from the examples, then rewrite those sentences using either commas, parentheses, or a colon. Second, identify at least one sentence each in which I used parentheses or a colon and rewrite those using em dashes. How do you think the change in punctuation affects the sentence? I’ve looked at the basics of the em dash, commonly referred to as the dash, in “Punctuation Pitfalls–The Em Dash and Its Cousin the En Dash” and “The Ellipsis or the Em-Dash.” But I realized there’s another aspect of this handy-dandy punctuation mark that I have yet to address: how does it work with accompanying marks? Or does it? As in so much of English grammar, the answer to the last question is, it depends. There are times the em dash should not and will never be joined with another punctuation mark, but then there are the times, it must include a companion. So which is which? In these complex sentences, a writer may chooses to substitute an em dash for the comma, in which case, the em dash is flying solo. If the parenthetical information set off by em dashes is either a question or an exclamation, a question mark or an exclamation point may precede the em dash. Example: Most of the politicians—who says they care?–seem to ignore the wishes of voters. If an em dash is used to indicate a sudden break in dialogue, it precedes the closing quotation mark. If the sentence continues, requiring a comma, the em dash precedes the comma. “I’ve had enough of your–,” she began, but her daughter burst into tears. If the sudden break belongs to the action rather than to the dialogue, em dashes are used after and before the quotation marks to separate the dialogue from the rest of the sentence. There you have it–our em dash friend isn’t always a loner. Depending on the circumstance, he can consort with punctuation partners. I’ve been accused (gently) of overusing em dashes, commonly referred to without the qualifying “em.” These punctuation marks [—] differ in length and use from their lesser known cousins, the en dashes [–]. The coach mapped out his plan of attack—a plan he hoped would surprise the opponent. The coach mapped out his plan of attack: a plan he hoped would surprise the opponent. Lewis and Tolkien—those are the Founding Fathers of Christian fantasy. As noted in an earlier post, “The Ellipsis or the Em Dash,” there’s one more common use—to indicate a sudden break in thought or speech. Jeff slammed the door before she could finish her threat. One more important point: no sentence should contain more than two em dashes. If further amplification occurs, then commas or parentheses should be used. But what about the en dash, that short little mark so similar to a hyphen? Chicago Manual of Style says the principle use is to connect numbers (and occasionally words). For example, if you give a span of time, say, between 1999–2004, the proper mark between the numbers is the en dash. Many writers are more familiar with the actual punctuation marks than with their names. The question is, when should we use … (ellipsis) and when — (em-dash)? On the other hand, the em-dash (longer than the en-dash and the hyphen) indicates a sudden break or an interruption. “Don’t you walk out on me! I said, don’t—” The screen door banged shut, and his footsteps tatted down the stairs toward his car. To remember the difference, I think of the three dots comprising the elipsis as slow: dot-pause, dot-pause, dot-pause. The em-dash, however, dashes in one straight, quick gesture.